This one-page teacher resource provides an at-a-glance overview of the multiple concepts that are represented with a fraction. 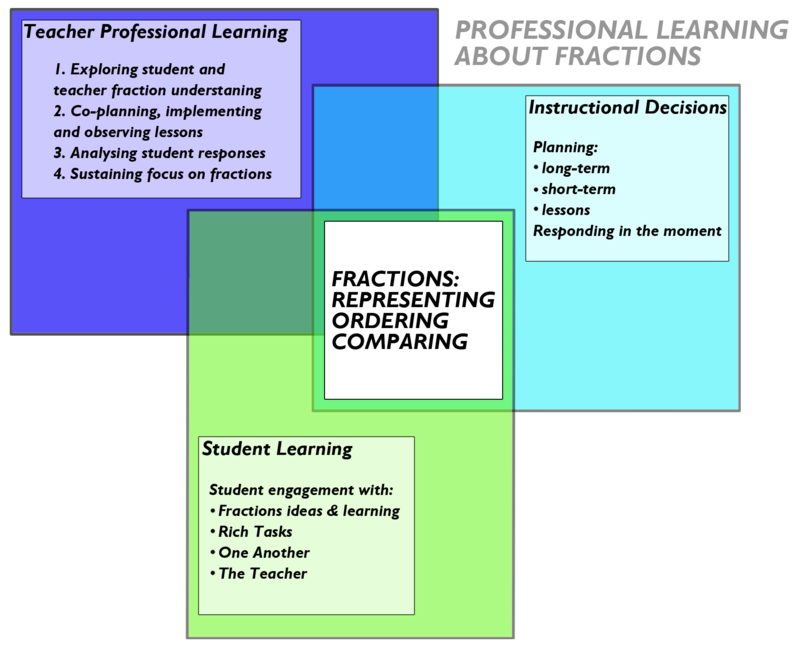 goals, results, and implications of the fractions research project. Interested in supporting colleagues in deepening their understanding of fractions? See this session plan for ideas. All references used to create the resources included in the Professional Learning about Fractions are identified. These resources show the development of fractions learning in the Ontario Mathematics Curriculum. Based in current research but designed to be easy for teachers to implement, these resources provide explicit instructional strategies to support improved student learning. Students in the junior grades are learning about representing, comparing and ordering fractions. The teacher teams designed these lessons to evoke and expose student thinking. This lesson allows students to share what they understand about fractions by representing 2/5 or 4/10. This lesson engages students in ordering fractions on a number line. In this lesson, students use a set of pattern blocks to generate fractions. This allows for discussion of the similarities and differences between set models and area models for part-whole relationships. Based upon the Gap Closing resource, this lesson requires students to represent improper fractions using a set representation. Building upon the representation lesson using 2/5 and 4/10, this bundle of five lessons supports students in connecting their knowledge of fractions to ordering on the number line and being more purposeful in the selection of representations for given contexts. These five lessons use a variety of materials to build student understanding of representing fractions using sets. This set of four lessons provides multiple learning opportunities for students to develop an understanding of equivalence through a variety of manipulatives and the number line. This set of four lessons supports students in connecting fractions, decimals and percentages by ordering them on a number line. This lesson could be utilized in earlier grades with simple modifications to the numbers provided to students. This comprehensive literature review provides a synthesis of the research to date about the teaching and learning of fractions from around the world and highlights areas of agreement as well as areas for further research.